Between traditional Africa and the modernity of mixed sounds by these three artists with significant international careers, Prince Diabaté, Jeff Kellner and Ahmad Compaoré invite us to a transcontinental journey between Conakry and Marseilles, thus remaining true to the melting pot of their cultures (Guinea, France, Burkina Faso). 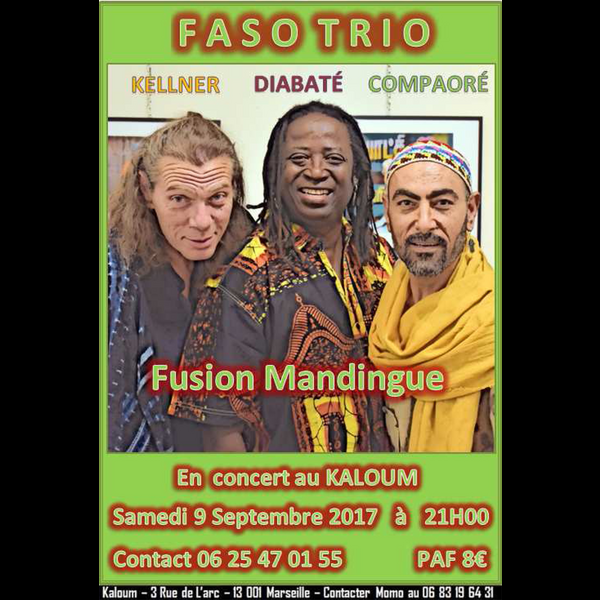 FASO TRIO proposes a repertoire both traditional and pop, with incursions in blues and funk, sustained by a rhythmics with rock overtones. Through the dialogue of their instruments, the musicians draw upon their diverse musical backgrounds and shared experience to produce a new brand of rootsy West-African music, multi-faceted, of universal appeal. Kaloum, 3 rue de l'Arc, 13001 Marseilles.